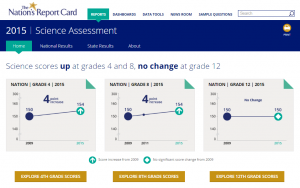 The National Assessment of Educational Progress (NAEP) released The Nation’s Report Card: 2015 Science, with results showing fourth and eighth graders increasing their science scores from 2009. NAEP measured students’ knowledge in the following areas: physical, life, Earth, and space sciences. Specifically, “how well they implement science practices, like using scientific principles and engaging in scientific inquiry,” said Linda Rosen, chief executive officer, Change the Equation. The assessment was administered from January to March 2015 and compared to the 2009 assessment results. Fourth-grade students significantly increased their average score by four points, up from 2009. When assessing competency over challenging subject matter, students scored 38 percent at or above proficient in 2015, up from 34 percent in 2009. The number of students who scored below basic has also decreased. Overall, science scores increased in 18 states/jurisdictions, and decreased in only one state. Eighth-grade students increased their average score from both 2011 and 2009. Thirty-four percent scored at or above proficient in 2015, higher than 30 percent in 2009. Average scores for female students were higher than their male counterparts in 2011. Overall, 24 states/jurisdictions had an increase in scores from 2009. Twelfth-grade students had no score change from 2009–including their proficiency scores. However, a higher percentage reported taking courses in biology, chemistry, and physics since 8th grade compared to 2009. “The more science courses a student takes, the better he or she performs on NAEP,” said Peggy G. Carr, acting commissioner of the National Center for Education Statistics (NCES). Rosen pointed to additional results from Change the Equation that revealed 81 percent of teens say science is interesting, but only 37 percent of students like their science classes a lot. Teens want more classes related to career (86 percent), job shadowing (83 percent), volunteering (82 percent), and career counseling (79 percent). The National Assessment Governing Board and NCES announced the results at the Smithsonian’s National Air and Space Museum in Washington, D.C.